Do you dream of owning a successful business? If so, join the fastest growing mobile fire prevention company in Canada! Fire-Alert is a leader in fire and safety, providing mobile fire extinguisher services and more to commercial, industrial and residential markets. Fire prevention is a "hot" topic so there's great potential for Fire-Alert franchisees. Interested in why we've been so successful in the last three years? Don't delay - franchises in regional areas are going FAST. Contact us today! Fire prevention is a hot topic – and Fire-Alert is the expert you need! With over 30 years in business, Fire-Alert is a true Canadian success story. We are always looking for highly motivated individuals to join the fastest growing mobile fire prevention franchise company in Canada. Fire-Alert strives to give franchisees the same opportunity to share in our success. 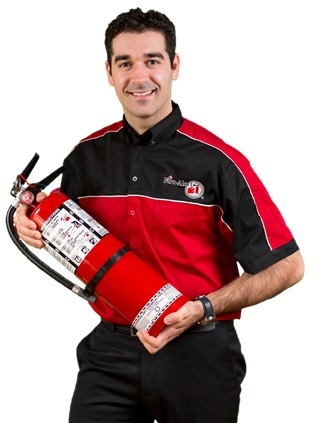 Fire-Alert is a Canadian mobile fire extinguisher and safety supplies organization, providing customers with a full range of fire and safety services. We can provide you with a knowledgeable and highly qualified solution to meet any of your client’s specific needs. The Franchisees' Choice Designation is awarded to franchised companies who have achieved a score that exceeds the benchmark and have demonstrated excellence in franchisee relations, team work and communication. Fire-Alert is honoured to have been presented such a prestigious award at the 2014 Canadian Franchise Association Gala and could not have done it without our exceptional team of franchisees. Fire-Alert takes great care in recruiting, screening and training franchisees. We believe that this is a major factor in both the growth of the brand, as well as the success of the franchisee’s business. As a franchisee, we will provide you with all the tools you will need for a fast return on your investment and a high profit potential. There is great opportunity for franchisees in every province so join the fastest growing fire and safety franchise in Canada. Don’t miss out on the chance to be a part of this success! As our way of saying thank you for your military service, and to assist you in successfully transitioning into your next career, Fire-Alert is honoured to offer qualifying veterans 12 months royalty fee free along with 10% off our initial franchise fee for a total savings of over $10,000! Continue to save lives with Fire-Alert by keeping our communities safe and up to code by providing them with their fire safety needs!